Jagoron is the name of a credit instrument of PKSF to initiate household based enterprise development in Bangladesh. PKSF extended its financial services for the rural poor through this programme from October, 1990. Under this programme, borrowers are encouraged to undertake family-based income generating activities. PKSF consistently addresses the rural poor. Since its inception, PKSF has been insistently supporting its Partner Organizations (POs). Funds are made available with least conventional formalities in the rural areas through these Partner Organizations. In 1999, PKSF felt initiated to extend its financial services for the urban poor also. In urban area, woman participation in Jagoron is higher in comparison to its rural counterpart and since they have higher participation in the labour market, larger access to material resources, greater mobility and meaningful role in the household decision-making process. Urban borrowers are distinct from the rural borrowers in a number of ways. They are the landless squatters and they usually take loan for small trading. Vulnerable to threats of eviction, they live in slums or makeshift shacks. The number of urban poor is continuously increasing as a result of forced migration, limited employment opportunities in the rural agriculture sector and recurrent occurrence of several natural disasters. 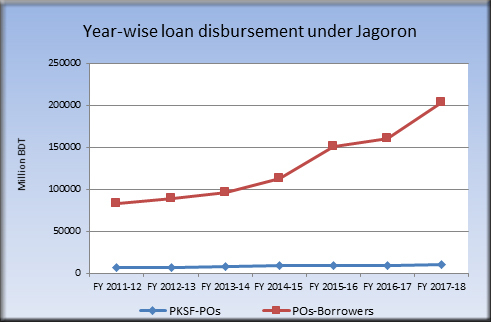 In FY 2016-17, loan disbursement of PKSF to its Partner Organizations (POs) under Jagoron is BDT 9.54 billion and outstanding amount of loan reached at BDT 18.91 billion. During the FY 2017-18, amount of loan disbursement from PKSF to POs is BDT 10.40 billion and outstanding amount of loan is 19.85 billion. During the FY 2016-17 POs’ loan disbursement to its borrowers is BDT 151.44 billion and outstanding amount of loan as on 30th June, 2017 is BDT 84.56 billion. During the FY 2017-18, loan disbursement from POs to borrowers is BDT 193.68 billion and outstanding amount of loan as on 30th June, 2018 is 100.95 billion. During the current FY (from July 2018 to August 2018) loan disbursement of PKSF to its Partner Organizations (POs) under Jagoron is BDT 1.96 billion and outstanding amount of loan as on 31st August 2018reached at BDT 20.11 billion. At the same time, POs’ loan disbursement to its borrowers is BDT 31.95 billion and outstanding amount of loan as on 31st August 2018, is BDT 102.92 billion. Up to August 2018, total number of borrowers stood at 6.58 million, which is 73.40% of the total members under this loan program. In Augusr 2018, the average loan size under this programme stood at BDT 32,563. Jagoron still dominates PKSF’s loan portfolio with its Partner Organizations (41.76%). Up to August 2018, cumulative loan disbursement from PKSF to POs and POs to Borrowers is BDT 126.43 and 1373.62 billion under this program respectively.